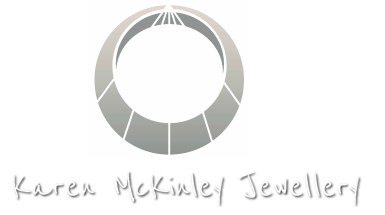 Karen McKinley Jewellery began in 2007, and offers high quality design and manufacture to clients who desire bespoke jewellery made exclusively for them. 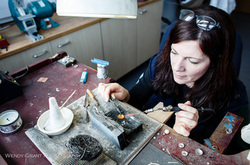 Karen also designs and handmakes ranges of silver and 18ct gold jewellery using a combination of traditional and modern techniques, incorporating diamonds and other gemstones. 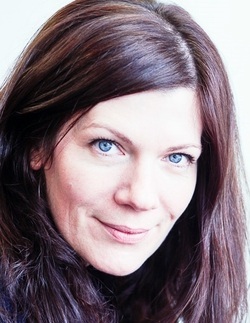 Between 1994 and 2007, Karen trained with a jewellery manufacturer in Belfast, Northern Ireland, becoming their handmade specialist. She worked exclusively with platinum, 18ct gold and diamonds. Karen undertook the Gemmological Association's Gemmology Diploma, providing the best set of answers in the preliminary examination worldwide. She become the first student in Birmingham City University to do so, winning the British Jewellery Association Prize for Gemmology and the Gem-A Preliminary Trade Prize (2001). She then went on the achieve Fellowship status with Gem-A (2002) and proudly displays the letters FGA after her name. 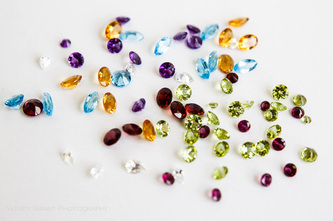 As a Fellow of the Gemmological Association of GB, Karen has studied gemstones in depth and loves to incorporate them in her designs; from the simplicity of a beautifully faceted diamond to the mesmerising nature of star sapphires and rubies catching the light. Karen has been a member of the Northamptonshire Guild of Designer Craftsmen since 2009 and exhibits with them regularly. She was on the Committee for 2 years as Exhibitions Officer. 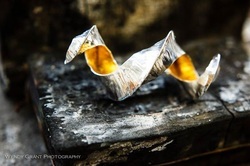 She is a member of the Association for Contemporary Jewellery - East Midlands branch, and exhibits with them as well. She takes part in Northants Open Studios every year.